Instead of exchanging gifts with each other at their annual holiday gathering, Fayette’s 30 school nurses decided to use their resources to help Fayette’s in-need students by making a donation to the CARE (Children at Risk in Education) Angel Tree Project. 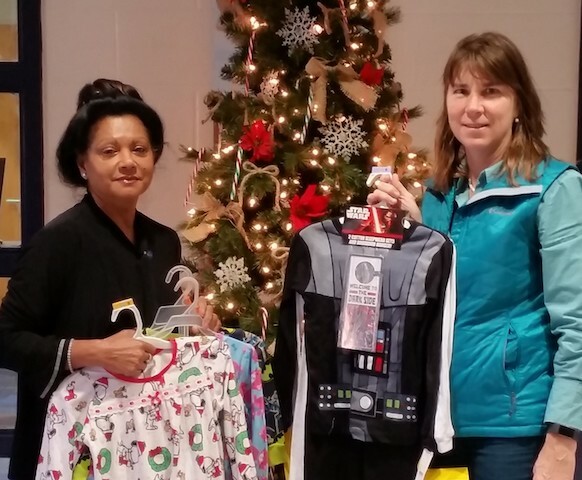 The nurses purchased 56 sets of pajamas that will be distributed to students who were on the Angel Tree this year and indicated a need for new pajamas. The Angel Tree Project fulfills the holiday wishes of economically disadvantaged students at schools throughout the county. School system employees, churches, civic organizations and local businesses participate in the program by adopting an angel from the tree, volunteering to help with gift wrapping and logistics, or all of the above. The Angel Tree Project will provide gifts this year for more than 200 students and their families, which include traditional items as well as basic need essentials such as toiletries, blankets, and even home repairs or tires for the family vehicle. School counselors make requests for students to be included on the Angel Tree; all requests are thoroughly vetted by CARE staff before being approved for inclusion. At least one family member must be employed, but not earning enough money to cover all of the family’s needs. In the above photo, school nurse coordinator Debbie King (right) with Spring Hill Elementary school nurse Nirmada Hall display the large box of pajamas collected for the CARE Angel Tree Project.